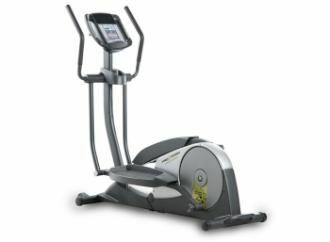 The ProForm StrideSelect Elliptical – All Basic Features at a Great Price! The Proform StrideSelect elliptical is another solid performing budget elliptical trainer from ICON Health & Fitness. Many of these trainers carry the “StrideSelect” name which can get confusing. Just keep in mind that it means these models have a small knob on the rear flywheel that let the user adjust the stride length from 11" and 13", which will hit the calves and quads, up to a 16" stride length, which targets the gluts and upper legs. UPDATE: The Strideselect has been discontinued and is no longer available for sale. You can check out all of the latest models here. The parts/labor warranty is weak, so do plan to get an extended warranty for least a year or two. Other than that, experts point out that the Proform StrideSelect elliptical has some strong pluses such as the basic design, adjustable stride length, music port, built-in fan, iFit® compatibility, ergonomic feel, quality, and noise level. Fitness pros will also mention that this is a shorter than average stride length, so taller users would be advised to look for a trainer offering an 18" stride. Consumers writing their own elliptical reviews are reporting positive reactions to the ProForm StrideSelect. They are especially pleased with the value, and thanks to the adjustable stride lengths, reviewers like that they can vary the muscle groups they target, resulting in faster toning and weight loss. They find the upper arms can get a little squeaky and wobbly but not by much. The overall sturdiness, quiet ride, and comfortable stance of the ProForm StrideSelect are fine for riders who are 200 pounds or less. (Ignore what the max capacity is listed at. Budget ellipticals are best for women and small adults only.) The fold-up design probably isn’t a selling point for most buyers because the unit isn’t that big, but folding it does make the unit easier to move. Selling for $499 (MSRP $999), the Proform StrideSelect elliptical is a surprisingly good little trainer. It offers all the basic features and you can’t beat the price. If you’re a moderate user (3 to 5 hours a week), this machine should give you a good workout for a couple of years. But if you plan to do intense daily workouts, you should step up to the sweet spot of elliptical trainers which falls in the $1500 range. If you can afford a bit more, consider the Proform Epic 1200 Pro (a Best Buy among most pros), or if you want to look at a different Proform at the same price as the StrideSelect, check out the Proform 850 Elliptical with GameFit.